Grace aspires to be both an inspiring teacher and a virtuosic, unique performer of all genres of music. She has years of private teaching experience, and works very well with all levels of students. Grace’s philosophy in teaching and learning music is that “teaching is not about molding a student into what one desires, but it is about catering to each individual’s needs to achieve his or her own potentials, may it be pursuing music professionally or for personal pleasure only”. She also believes that music enriches children’s souls and that the roles of music educators are beyond notes and rhythm. 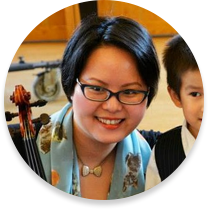 Grace Tsang has had twelve years of studio and ensemble teaching and four years of Suzuki Method teaching experience instructing violin, beginner viola, Suzuki group classes and music theory. She works very well with all levels of students. Grace’s philosophy in teaching and learning music is that “teaching is not about molding a student into what one desires, but it is about catering to each individual’s needs to achieve his or her own potentials, may it be pursuing music professionally or for personal pleasure”. She also believes that music enriches childrens’ souls, and that the role of music educators are beyond notes and rhythm. Grace was born in Taiwan and she began studying music at the Suzuki and Ju Percussion Music School at the age of three and has been mesmerized by music ever since. She started learning the piano at age six, and the violin at age seven. She then successfully auditioned for Guang-ren Private Elementary School For Musically Gifted Children in Taipei, Taiwan. After her immigration to Canada, Grace studied under Larraine Grescoe and Mark Koenig at the Vancouver Academy of Music. She was an active player in the Vancouver Academy Orchestra and the Delta Youth Orchestra, where she also made her debut solo performance at age thirteen. Grace graduated with a Bachelor’s Degree in Violin Music Performance from University of British Columbia in 2007. She received an entrance scholarship from UBC for outstanding audition. During her studies in UBC she was leading UBC Symphony, Chamber Strings, and Contemporary Player while under the guidance of Andrew Dawes and Jasper Wood. Grace also completed her Suzuki Violin Teachers’ training for Book one through four under trainer Joanne Melvin and Elyne Ras from the Suzuki American Association. She attends Suzuki teachers’ training classes and seminars regularly.